Elegant meets effortless at Modera 55, where easy access to transit and buzzworthy dining options combine with fashionably-appointed floor plans and standout community amenities. Outfitted with gorgeous finishes and resort-style social spaces, Modera 55’s smartly-designed Morristown apartments will ensure you and your home are always in style. From stone countertops to impressive nine-foot ceilings, the timeless design of the building is modern and fresh. Whether taking a soak in your freestanding bathtub or relaxing al fresco on your private balcony, you’ll do it in style at Modera 55. Community amenities abound at Modera 55, offers all the features you need — and some you didn’t know you were missing — from an outdoor kitchen and bar to a car charging station. Experience life at the top with a truly stunning, expansive rooftop lounge and sundeck offering spectacular panoramic views of Morristown and beyond. Be within easy reach of everything the Morristown scene has to offer. With a Walk Score® of 94, Modera 55 places you moments from neighborhood restaurants, coffee shops, groceries, green spaces, and entertainment. Have more than a home at Modera 55. Come Live in Style in Downtown Morristown. 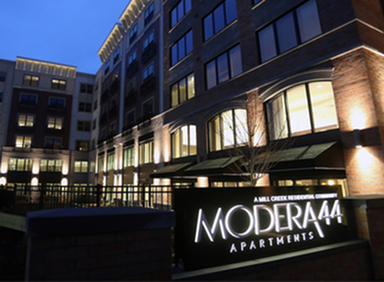 Now Leasing at Modera 44.